I grew up believing that doing unto others is the appropriate way to behave – I certainly have my moments of deviation, but they are – by a long shot – the exception and not the rule. I’ve always, therefore, subscribed to the notion that what we give out comes back to us, multifold – Karmic law, Law of Three, whatever you want to call it…I’ve seen it far too many times to have any doubt at all. Add some painful and challenging experiences – and don’t we all have our stories? – my subscription to the idea that “rising above” is the right way to be has multiplied exponentially. Hate is a good example. I don’t sincerely “hate” anything – in my mind it is a wasted emotion, and it gives far too much power to something I really don’t like (people, places, OR things.) Hate takes as much – or more! – energy than love. . .so if I’m giving that kind of attention to a “dislike,” I’m wasting precious resources, time included! It took some time to understand that, though. As children we love to say, “UGH! I HATE HOMEWORK!” or “I hate so-and-so!” “Hate” just falls into the two categories of #1, a word, and #2, a negative. Over the years, however, I learned that it was an extreme expression, that it carried too much of a negative vibe to carry around, and that the act of hating in and of itself reflects poorly in my own conduct. Treating others with respect doesn’t mean I have to give out free passes or put people on pedestals, let’s be clear. What it means – to me – is that I treat others with decency and kindness. Now…let me also say… I live in a tough city. Even MY buttons are pushed at times, and that says a lot! But I am constantly checking back in with myself when feeling irrational, upset, frustrated etc… If I can’t be respectful (and in certain moments, I don’t feel I can live up to it) I simply do not engage. Easy as that. The only person accountable for what I put out is me, and if I put out something negative…it’s going to get me into trouble in one way or another. As my behavior is my own, how other people behave is their business. In the modern world (and in a tough city), people might argue that others “don’t deserve respect.” Conducting myself in as positive a way as I can doesn’t mean I don’t see the poor behavior of others, that I dismiss it, that I allow it, or that I’m saying “go ahead and continue acting that way.” It just means that I am putting a positive energetic spin on myself. When dealing with someone I see often, simply rising above allows me to move forward through my day without the burden of taking on his or her attitude, and neither the weight of being a nasty person (which I don’t want to be.) If, however, it’s someone I’ll likely never see again, I still can move forward knowing that I’ve been upstanding in spite of someone else’s conduct. It is always up to us how we want to feel, what we associate with, what we allow… Acting disrespectfully reflects negatively in every possible way, and speaks volumes about one’s character. 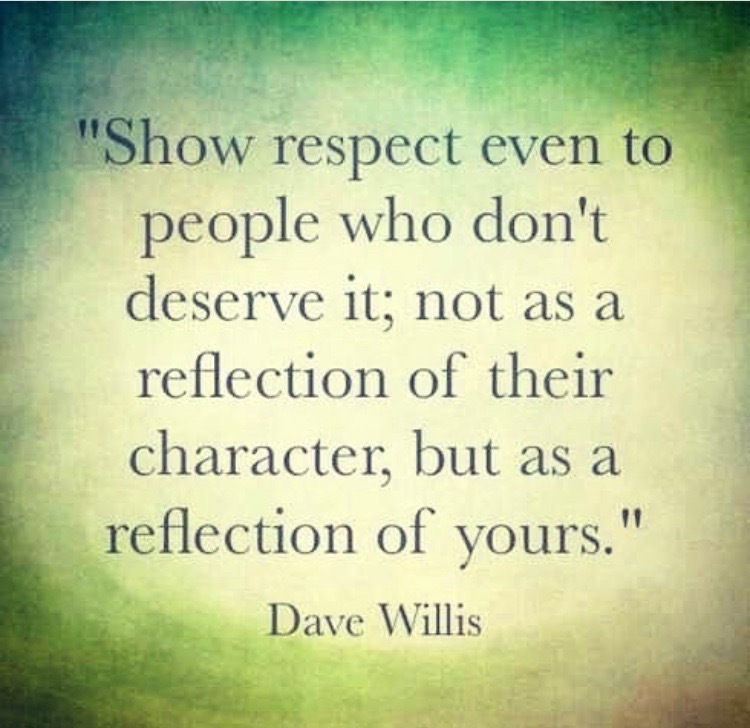 To show respect even when it doesn’t feel warranted, however, also says rather a ton about a person. I aim to be the latter, if for no other reason than to me it is a noble pursuit energetically, as in terms of self development. I have a ways to go too but you can be sure I try to check myself. Often. « Martial Arts Humor – What Was That Escape Again?